Most of my tomato plants succumbed to blight this year. So our usual August tomato glut hasn't really happened. But the silver lining is that the one new tomato variety I tried this year not only tasted good, but it has stood up to the blight better than any of my long time favorites. The Speckled Roman is really striking in appearance too. All things considered, I'm pretty certain I'll be growing this tomato again. At the end of last week I gathered the largest bunch of tomatoes I'd been able to get together at one time all summer. It came to a bit over 6 pounds. Not a huge amount when it comes to canning, but certainly more than we were going to eat fresh. After letting them ripen a bit inside, out came my canning equipment and the stuff I use for roasted tomato sauce. Firstly you'll need several pounds of tomatoes, a few onions or onion equivalents, some garlic, olive oil, tomato paste, and seasonings. You'll also need large sheet trays with rims, and some thin wire cooling racks or the ones from a toaster oven. You need to come close to filling each sheet tray with racks. Having a little extra space on the sheet trays that the racks can't completely fill is ideal. You also need aluminum foil, and previously used pieces will work just fine. 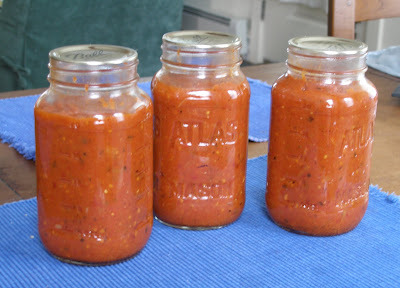 A blender or food processor will be very handy, and then you'll need storage containers for your sauce. 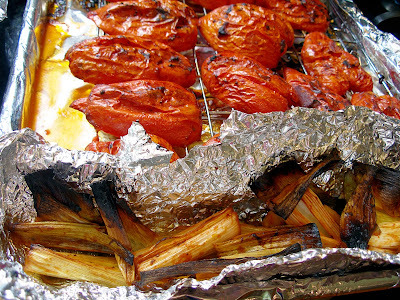 Begin by lining your sheet pans with one large sheet of aluminum foil each. Place the racks over the foil. Wherever you have a fair-sized gap between the rim of the sheet tray and the racks, place a piece of aluminum foil that you shape into a little bowl or tray. Arrange you oven racks to hold however many sheet trays you are working with. Preheat the oven to 450 F (230 C). In a large mixing bowl, put a few heaping tablespoons of tomato paste. (Use the ice cube tray trick to make sure the rest of the can doesn't go to waste.) Add a roughly equal amount of olive oil. Put in some seasonings such as salt, pepper, and a good pinch of whatever herb you like. Fresh basil or oregano from the garden is nice, but thyme could work well too, and don't disdain dried oregano either. Blend all these ingredients together with your fingertips until it's more or less uniform. We were out of onions when I made this batch of sauce. So I used the first leek of the season from our garden. A small head of homegrown garlic is in there too. Peel and coarsely chop a quantity of garlic, and about one small onion for every 2-3 pounds of tomatoes you've got. (Shallots or leeks will work too, if that's what you've got.) Set the garlic and onion aside. Next, cut your tomatoes in half from stem to blossom end. If you wish, remove the tough stem core. Working in manageable batches, add the halved tomatoes to the bowl with the olive oil and tomato paste mixture. Toss the tomatoes with your hands until they are well coated. You especially want the skins well coated. Arrange the tomatoes cut side down on the racks over your sheet trays. Space them as tightly as possible. When all the tomatoes have been coated and arranged on the racks, add the onions and garlic to what remains in the mixing bowl. Toss them well, soaking up the last of the liquid. Arrange the onions and garlic in the little foil bowls on the baking sheets. Place the sheets in the oven and set the timer for 20 minutes. If you're working with more than one sheet tray, change the position of the trays top to bottom and rotate each of them 180 degrees. Then roast for an additional 20-30 minutes. The skins should be charred in places, and a fair amount of liquid should have dripped into the aluminum foil on the sheet trays. Remove the trays from the oven and let them cool a bit. 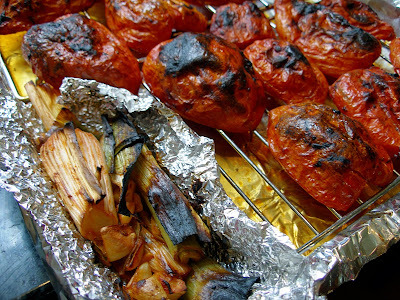 The tomatoes on the other sheet tray were better charred than these. But these leeks were nicely caramelized. See the orange liquid? Don't let that go to waste! Working in batches, place the onions, garlic, and roasted tomatoes in a food processor, working with kitchen tongs. (I don't bother removing the skins, but you can do so if you wish. They should be fairly easy to remove at this point.) Process the sauce until smooth. You may want to include the light colored liquid that has dripped onto the sheet tray. This also makes a nice addition to light summertime vinaigrette though. At this point, the sauce is ready to eat or to store in whatever way you prefer. I only got three not-too-large jars of sauce out of this batch. But as they say, half a loaf is better than none. For anyone wondering about the mechanics of this sauce methodology, the natural sugar in the tomato paste is what allows the tomato skins to char nicely and give a roasted flavor to the sauce. The foil liner on the sheet pans doesn't really save you any cleanup (since you're going to wash that foil and re-use it, right? 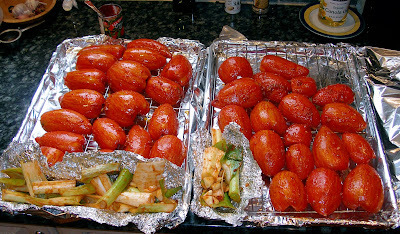 ), but it does prevent the liquid that comes off the tomatoes from burning on the sheet pan and becoming useless. Trying this without the racks will give you limp tomatoes that have boiled in their own juices, without much flavor. The racks also allow some of that liquid to evaporate so that the sauce is naturally thickened, even if you add the drippings back in. 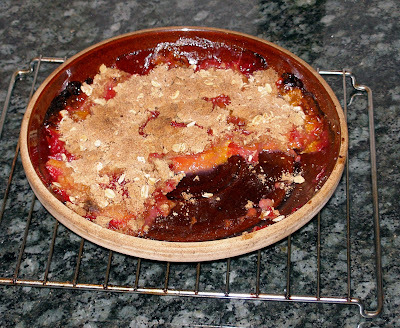 A little while ago, Kathy wrote about homemade "convenience foods" and included a recipe for a very simple crumb topping for cobbler. It sounded pretty good to me, so I whipped up a batch. It's a rather large yield recipe, so if you don't eat dessert very often or if fridge space is limited, I'd recommend cutting it in half. You might have to make it in half batches anyway, because you'd need an awfully big food processor to handle these quantities all at once. Also, I found it a tad on the sweet side for my tastes, so I think I would modify it slightly the next time around by both cutting the sugar and upping the oatmeal. Her standard batch came close to filling two half-gallon canning jars, which I have to admit are a little tough to find room for in the fridge right now. 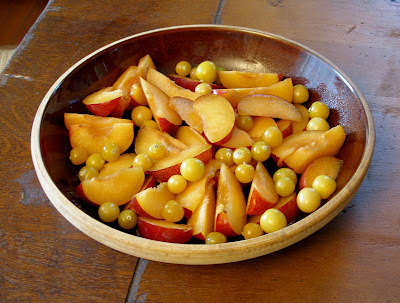 Still, it was wickedly satisfying to slice up a few late plums we bought at the farmer's market this weekend, supplement them with some volunteer ground cherries from our garden, plop them in a small pie plate, and top them with just the right amount of my homemade convenience food. Since I'd used my small pie plate for the cobbler, it fit in the toaster oven. About 45 minutes later, it was done. I didn't even bother to thicken the fruit. Some might call this more of a crisp, though the addition of oatmeal isn't standard in crisps. Whatever you want to call it, it was delicious! The beauty of having plenty of this topping on hand is that it truly is convenient. Quantities sort of become irrelevant. If I had just one plum and a hankering for something sweet, I could put just that amount of fruit into a ramekin and make a single-serving cobbler/crisp. Having this kind of stash pretty much vaporizes any sort of weasely justification for giving in and paying for store-bought pie or dessert. Once the topping is waiting in your fridge, it's trivially easy to cut up fruit, top it, and get the dish in the oven. Five minutes, max. So you'll buy the fresh fruit instead of the over processed and over packaged pie. And this'll work with just about any fresh fruit too. Try it! You'll probably like it. I know I do. We had some respectably hot and muggy days this month, which is nothing out of the ordinary for August, and it did finally make our eggplant and peppers get busy. But temperatures in the high 80s with humidity above 90% make me wilt. Add to that the need to preserve garden bounty, which too often involves heating up the kitchen, and I'm one cranky homesteader sometimes. 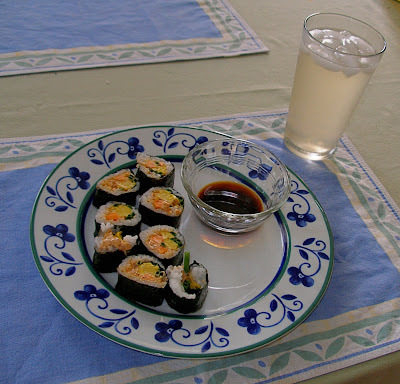 So I decided to make sushi rice in my solar cooker and whip up some garden futomaki for lunch. Futomaki means "big roll" in Japanese, and most often includes vegetables. My futomaki is most always entirely vegetarian. I like a cold lunch on a hot day. Being able to get the rice cooked outside without using any gas or electricity is pure bonus. Best of all, the filling ingredients in my futomaki all came out of my own garden this time. The eggs came from our girls. The tamago, or Japanese egg omelet, was the only part of the dish I had to cook inside, and it takes almost no time. It's just a few beaten eggs seasoned with the barest whiff of sugar and soy sauce, then gently cooked over a medium flame until firmly set, and then allowed to cool. The carrots and chives also came from our garden. I like to use a lot of chives, but the carrot slices can't be too thick, or they'll overwhelm everything. If I had an avocado tree, you can bet that I'd include some avocado in these rolls. This fall if I'm successful at digging up any volunteer burdock roots, I may pickle them and try them in futomaki. Burdock is commonly pickled and eaten in Japan, where it's called gobo. Once the rice is cooked, it is splashed with rice wine vinegar and allowed to cool. Then one uses wet hands to pat it onto a sheet of nori, arrange the filling ingredients, and roll it up tightly with the help of a bamboo mat. Assembling futomaki looks and sounds more difficult than it is, and it's something you get better at through practice. Oh, and that drink in the picture above is flavored with some peach shrub I made with gleaned peaches. It's quite addictive stuff! More food posts coming this week! 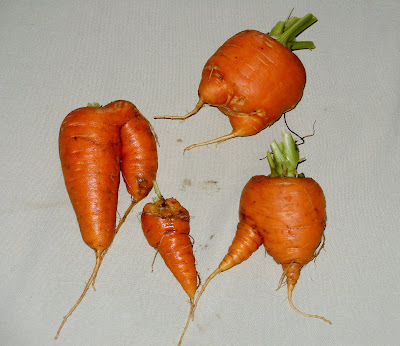 The Chantenay carrots I grew this year are coming in well right now. They don't look normal, do they? Gardening has so many of these "real world" opportunities for discovery. Yet even if their tops are nibbled by rabbits, and they're not exactly supermarket models, these big fatties give me a whole lotta carrot to deal with. So I've been making escabeche with them, our recently harvested garlic, and some poblano chili peppers that are also ready in my garden about now. In my usual, rambling, inexact way, I present my methodology/recipe for this dish. The steps may sound a little complicated, but I find that I can hand wash a few dishes or attend to other things during the hands-off periods in the progress of the recipe. First, dig up some carrots that are ready to come out of the earth. Rinse 'em off, compost the greens, and trim off any wispy side and bottom roots. Once inside, scrub the skins very well with a scrub brush, and trim off any nibbled areas, but do not peel them. Select a saucepan according to the quantity of carrots you have. You'll want the carrots to fit (just) in a single layer in the bottom of the pan after a very coarse chopping up. Put this pan on the smallest burner you've got. Into the cold pan, pour sufficient olive oil to form a shallow pool that covers the bottom of the pan. You want more oil than just enough to coat, but only a very shallow pool, about 1/8 inch or so. Add one or two bay leaves (fresh are spectacular if you can get them) and put the heat on under the pan at the lowest possible setting. Let it heat for about 6 minutes. Meanwhile, coarsely chop the carrots. Slice a couple of chili peppers open, and knock out any loose seeds. You may remove all the seeds if you prefer. Smash and peel two small cloves of garlic, and have some oregano on hand. (Don't overdo the garlic; it should not be the dominant flavor in this dish.) Optionally, rainbow peppercorns can also be used, so if you want those, have them handy. Remove the bay leaves from the oil and discard them. Increase the heat to medium high and add the chili pepper slices and the crushed garlic. Cook the peppers and garlic in the oil for 2-3 minutes, turning once or twice. Remove the chili peppers and reserve. Add the chopped carrots, the peppercorns if you're using them, and a very hefty pinch of the oregano. Increase the heat to high and immediately add enough water to just barely cover the carrots. 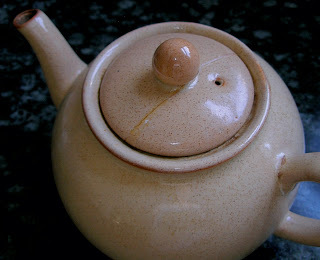 Put the lid on the pot and bring the liquid to a rapid simmer. When the water simmers well, turn off the heat. 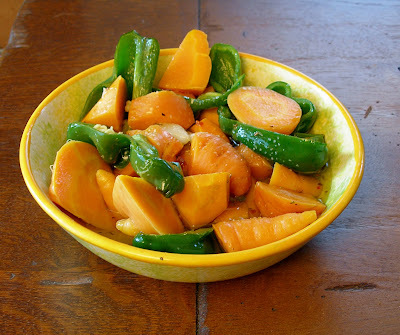 Without dumping the contents of the pot into a colander, fish out the carrots and remove them to a bowl right away, and add the reserved chili peppers to them. Douse with a generous splash of distilled vinegar while the carrots are still hot. Toss the vegetables well in the vinegar. When they have cooled slightly, skim some of the cooking liquid out of the cooking pot and add it to the bowl with the peppers and carrots. Aim for about a 50-50 mixture of vinegar and the oily cooking liquid. Sprinkle with salt to taste. I know you can't see the liquid in this picture, but they're soaking in it. Serve the escabeche while still slightly warm, or chill and snack on them from time to time. They'll keep for a week or so in the fridge, and they're a nice addition to summertime smorgasbord-type meals. Also good with open faced tomato and basil sandwiches. These barely-cooked carrots have a nice firmness to them that is almost crunchy. Toothsome and satisfying. Brave eaters can enjoy the peppers. (And shhhhh! Don't tell anyone they're vegan!) Pretty tasty, if I say so myself. The lovely gash I put on my finger while dealing with blighty tomatoes put a crimp on my posting for a while there, but now is healing up nicely. I thought I'd catch up on a few projects I've been meaning to post about for a while, but have never found the time to do. We've got some new toys: one purchased, one homemade for nearly nothing, and one made with some relatively cheap materials and an instructional class. 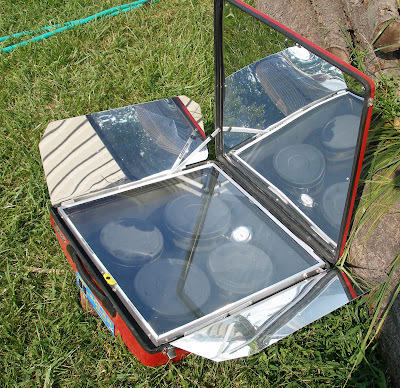 The first is a Tulsi-Hybrid Solar Oven. I broke down and bought this several months back and have been trying to learn to cook with it ever since. I have to say that this has been a challenge. We're far more likely to have a few clouds scud across the sky than wholly sunny days. While a few clouds are just fine when it's blazing outside, it's just not feasible to cook in a solar oven on a cool spring day with partly cloudy skies. This reflects a lack of really thinking this purchase through on my part. When I have cooked things in the solar oven, it's taken quite a bit of experimentation to get things to turn out right. Also, the Tulsi Solar Oven has no mechanism for leveling itself, which is an issue when cooking with liquids. The best place for solar exposure on our property is non-level patch of lawn, so I've had to take measures to level the oven when setting it up for cooking. This wouldn't be so bad if it were once and done each time I cook. But since I need to turn the oven occasionally to track the sun, that means re-leveling it with each turn. Hassle. Now I think we need to add a solar oven table to our list of projects for next year. It would be nice to have a level staging area with a bit of "counter space" for the solar cooking I do. Using the solar oven definitely requires me to be on my game early in the day when it comes to meal planning. I've had best results when I get my food into the oven by 9am. Quiches and strata have turned out fairly well for me. On a sunny day, I've been able to get the oven up to 270 degrees F (132 C) in a couple of hours when the outside temperature was 84 (29 C). Obviously, ongoing experimentation is needed on my part. Next up is our first proper cold frame. We built this from a wooden packing crate for an industrial sized air conditioner. Our neighbor is an HVAC contractor, and so periodically discards such items with the use of a "FREE" sign on his front lawn. Most convenient for us. It was open on one large end, evidently where a lid had been ripped away. This wasn't best quality wood, but it had a great shape for a cold frame, and that open side seemed perfect for the bottom of the frame. I first chose a spot where it would be located, on the southern side of our garage, which is currently the last best sunny spot on our property. I parked the hens in one spot for a week to allow them to destroy the turf there. Then I added a bucket of half-finished compost from our pile each day for another week. The hens happily scratched through the compost to find bugs, breaking it down for us, while adding their manure to the spot I had chosen for the cold frame. I added some aluminum foil inside the frame to bounce sunlight around inside of it, and then filled it with a rich mixture of compost and our local clay soil. Leaving the box tightly sealed up on a few sunny days will, I hope, bake any incipient weedy seeds or seedlings. I've ordered a few more seeds specifically for cold hardy and compact vegetable varieties. The cold frame gives us about 9.5 square feet to plant in. I'll be starting seeds in the frame towards the end of the month, after the hottest days are over. I've found very useful guidelines for planting dates in Eliot Coleman's Four-Season Harvest , and The Winter Harvest Handbook . I highly recommend them both to anyone thinking about season extension. Well, that about wraps up our recent outdoor projects. 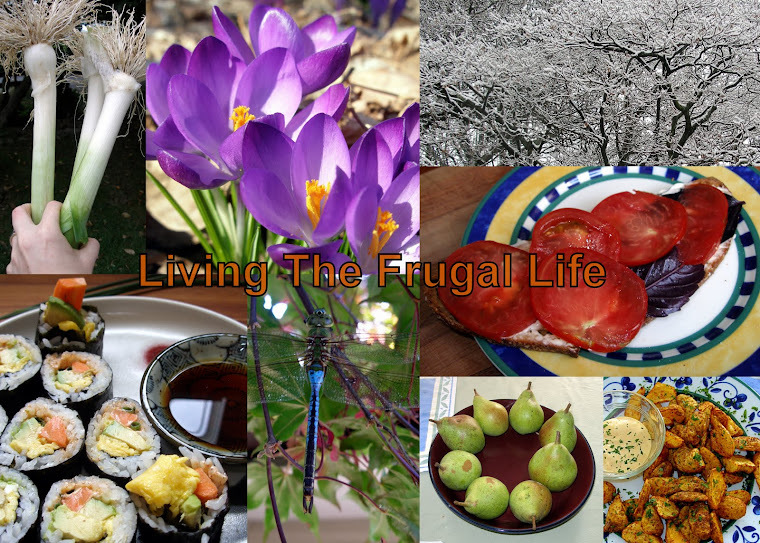 I'll post soon on some of the yummy things I've been doing with our garden produce and some gleaned fruits. I'm well behind in many things this summer, so it's no big deal if I'm a few days late with the Independence Days report. It's not as though I've been particularly reliable about this weekly project anyway. Find out more about this Challenge that Sharon issued to all of us, and you can participate too! It's been a hell of a year for gardening. The wet June we had gave us July as a reprieve, just enough to hope for a bountiful late summer and fall recovery. But it was the gift that kept on giving, and this month it brought us late blight - first on the potatoes, and then on the tomatoes. It's been a challenge to retain the optimism that is the birthright of every gardener. I don't know how or why we gardeners inherit this trait. I can assure you that in every other aspect of my life, I am intensely cynical and curmudgeonly. In my own garden I am eternally hopeful. Even though there will likely be no homegrown tomato sauce this year, I believe we have even odds on salvaging a potato crop, thanks to the advice of our local Agricultural Extension agent. And the brassica family may yet redeem the entire gardening year. I have hopes yet of my Tuscan kale, three varieties of cabbage, Brussels sprouts, and daikon radishes. And I have to admit that the popcorn, soup beans, parsnips, and especially our apple tree, all look like they are going to yield very well. Giving me more reason to be optimistic is the fact that we built our first cold frame over the weekend. As with our rocket stove, we used primarily salvaged materials for the project, and I now have about 9.5 square feet of space in which to grow vegetables for the coldest months of the year. 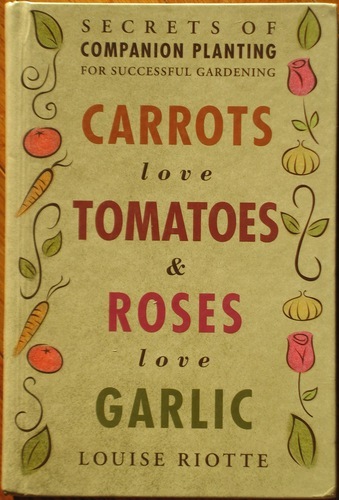 Not to mention it gives me the opportunity to try out some new vegetable varieties. Varieties that will grow in a compact form and tolerate very cold temperatures is what I'm looking for. I'm pretty excited about it, small though the space may be. My Independence Days report covers what I've been up to since the beginning of the month, more or less. Plant something: daikon radishes, lettuce, snow peas, and the last of the open-air beets and carrots, put in a few mini cabbage starts I picked up at a local Mennonite nursery. Harvest something: Tomatoes, squash, eggplant, just barely edible lettuce, calendula, beets, a few snow peas, Swiss chard, spare cabbage leaves. One plant's worth of potatoes, just to see if the blight had hit the tubers. So far, it hasn't. Eggs from the girls as usual. I've also been lucky in the gleaning department this year when it comes to fruit. Preserve something: I'm smoking as many paste and cherry tomatoes as I can get my hands on. Our tomato crop is coming in very sluggishly and I destroyed a few plants with late blight showing on them. I don't expect to get enough to make much sauce at all this year, so I'm putting up the small quantities I'm getting through smoking and then dehydrating. These little gems are fantastic in sauces and soups over the winter months, adding a smokiness that rivals any good quality bacon. We didn't have enough of them last year, and we sure won't have enough this year. But I'm doing what I can. Also have some calendula petals steeping in olive oil in the hot sun, thanks to El's inspiration. I'll make up a batch or two of balm from them later this week. Two depressingly small batches of kale, blanched, chopped, and frozen. Still hoping that my ship will come in with the fall kale. I've got white peaches steeping in vinegar to make a batch of shrub, and I'm dehydrating some apples with a light dusting of cardamom sugar, a peculiar conceit of mine. I prefer cardamom to cinnamon in many sweet recipes, particularly where apples are concerned. I'm hoping these local and gleaned apples can substitute for at least some of the raisins and other dried fruits that I like in my winter oatmeal and baked goods, and which I routinely have bought in the past. Canned ten half-pints of mixed berry jam. The wineberries were volunteers on our property, and the blackberries were gathered from a relative's patch (with permission, of course). My husband even made some peach freezer jam from the peaches we gathered at the same time. Too many of the peaches however succumbed to the brown rot before we could use them. Made and froze a double batch of zucchini-lemon muffins with our abundant zucchini. I could have quadrupled the recipe a few times over and not used up all the zucchini we've got. Hmmm...I guess I am putting some things up, though it has seemed that I'm twiddling my thumbs at peak storage season due to poor harvests this year. 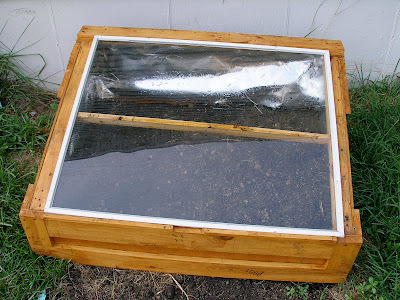 Waste Not: We used a wooden packing crate for an industrial air conditioner (that was set out next door earlier this year with a FREE sign) to build a moderate sized cold frame. We even reused some of the nails we had to pull out of it. Other wood salvaged from dumpsters was used, along with a safety glass window from a salvaged storm door. Preparation: Nothing new here, unless I can count the cold frame in two categories. Built Community Food Systems: Does accepting surplus fruit from a small scale farmer I know count? It seems too that my raised asparagus beds have inspired a relative of mine to build some as well. Although I make no apparent headway when I try to persuade people verbally, I guess some people like what I'm doing enough to imitate me. If that's keeping up with the Jones (me, in this case), I won't condemn it. Ate the food: mostly just fresh vegetables from the garden. I made peanut rice noodles with whatever happened to be on hand from the garden. It's a nice flexible dish that you can really load up with lots of veggies. Even the leftovers aren't too bad, if there are any. 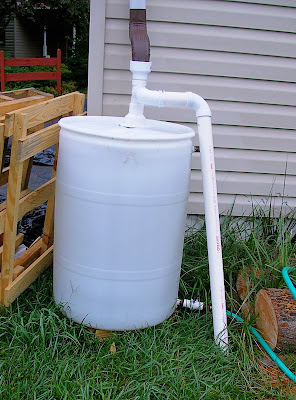 August Frugal Action Item - Repair It! I was already late with this month's challenge. Then we got hit with late blight on our potatoes, and then our tomatoes, just as the garden was about to start producing in earnest. To top everything off, I gave myself a nasty cut on one index finger, which makes typing pretty difficult. So...a belated an abbreviated Action Item this month. My apologies. Finding ideas that nearly everyone can put in to practice is tough; I want both renters and homeowners, young folks just starting out on their own and older adults to be able to use these Action Items. So this month I'm going to focus on the famous dictum: "Use it up, wear it out, make it do, or do without." Too many goods are not thoroughly worn out and used up when they are discarded in our overdeveloped world. A rip, dent, nick, or break is good enough reason to throw something away and buy a new one. Now, I'm no expert when it comes to things with gears and circuits, and I recognize that I'm lucky to have a mate who is pretty good with such complicated devices. Not everyone is so skilled or so lucky. But even with my lack of technical expertise, there are plenty of things that I can repair if something breaks or goes wrong. This month I'm going to review a few basic supplies and some techniques. You'd be surprised how many things can be fixed with this small set of tools. The screwdrivers and wrenches should be obvious. Often all that is needed to return something to working condition is to tighten a screw that has come loose. Those who are more ambitious in fixing things need screwdrivers to open up appliances and poke around to see what's amiss. The drill and baling wire are surprisingly close to the needle and thread. I've repaired quite a few plastic items, or prevented cracks in them from progressing to the point where the item becomes unusable by "suturing" the item up with a drill and small gauge wire. It's a sort of stitching technique. We salvaged a wheelbarrow with a cracked rim at the nose of the barrow, and I've managed to keep my ancient plastic vegetable steamer in service with the same technique. (The rubber coating is entirely optional.) Once you learn this simple trick, you'll probably find uses for it in one thing after another. 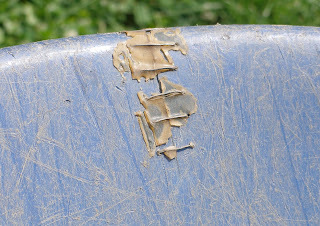 It's especially useful to keep cracks from growing in plastic items. With the right drill bit, it can be used for ceramic items too, if need be. Speaking of ceramic, a variety of glues will come in very handy for all sorts of breaks and chips. True, broken ceramic items are hard to disguise and it won't be much use trying to repair a serving bowl that has shattered in several pieces. But if the item doesn't need much strength, or if the break is just a chip, a good glue job will extend the utility life of the item. And at the least, a beloved item with no further utility can be displayed if it's pretty enough. Ceramics broken beyond repair can also be accumulated for mosaic projects if you happen to be the crafty sort. Many things can enjoy a second life through crafts. I'm really in no position to lecture anyone on the art of sewing. I can hand sew simple repairs if the rips are caught in time. My husband is far more diligent about sewing up his leather work gloves and pants. Those he's repaired repeatedly he calls his "frankenpants" or his "frankengloves." Still, a needle and thread are essential basic repair tools to have in any home. And it takes no particular talent to use them well enough for effectiveness; aesthetic considerations are another matter. What repair techniques and tools are most used in your home? Well, I unexpectedly and rather unhappily spent a good deal of time today dealing with potato blight. As it turns out, I have the dubious honor of being the first resident of my county to report a case of blight on potatoes. I knew I had to act quickly once I had identified it, but I had questions about how I might salvage some of the potatoes in the ground, if that were possible. Fortunately I did one smart thing; I called my county Agricultural Extension office. After briefly describing what I'd seen (darkish spots on the potato leaves, not starting at the leaf tip, and a faint white, fuzzy ring around the spot on the underside of the leaf), the Extension officer asked to come to our property to collect a sample for testing. I told him to come right over. It was fortunate that I called him because he gave me good advice. We found the blight on only one of the four varieties of potato I planted this year, the La Ratte heirloom potato. Without his expert advice I would have pulled all these plants out of the ground, salvaged what potatoes I could find, and would have bagged the green parts of the plant for destruction. His advice was to cut the infected plants right down to ground level instead. He told me that the airborne fungal spores on the leaves will not travel down into the ground through the vascular system of the plant. (There are cases however of infected seed potatoes, in which the blight damages the plant from the ground upwards.) Had I dug for the potatoes in the process of getting the plants out, spores from the leaves would certainly have made contact with the potatoes. So right now, the tubers are probably not infected. But if the ground is disturbed, the spores may find their way onto the surface of the potatoes, which can then become badly infected during storage. Rain helps move spores from the leaves to the ground, and as the potatoes grow in the earth, they tend to crack the dirt apart, providing a perfect avenue of infection. He advised me to get rid of all traces of the above ground plants, let them bake in the sun in black plastic bags and wait a few days before digging up any spuds. I did that, then came inside to take a shower in order to get rid of any spores I had on me. 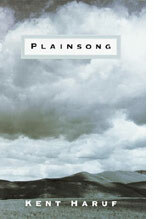 The clothes I wore were washed and hung in the sun to dry. Then I sterilized the tool I used to cut the potato plants. I plan to give it a few days before trying to harvest the potatoes. With some luck, I will have a limited crop of new potatoes from this variety. They won't store well and will need to be eaten up very soon. With a great deal of luck, I may have saved the other varieties of potatoes I'm growing from infection. But I'm not holding out too much hope there. I'd be fairly surprised if the other plants don't show blight soon, given our weather forecast of rain tomorrow. I know I'm late with the Action Item for this month. I'll try to have it posted tomorrow. It's been a busy August thus far.